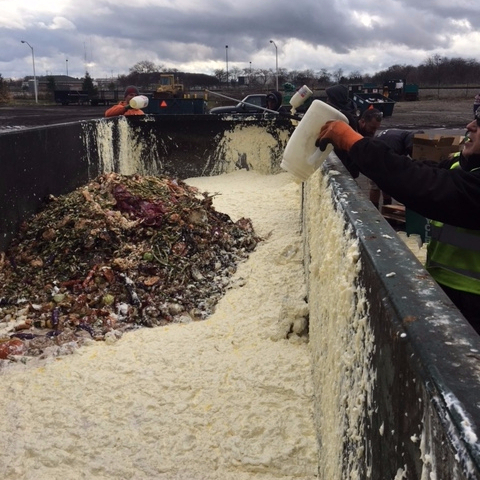 What Do You Do With 10,000 Pounds of Spoiled Mayo? The title above is a real problem — or was. The picture below was the solution. Michigan State University has more than 50,000 students enrolled in any given semester. That’s a lot of mouths to feed, and to accommodate those often hungry students, MSU operates a massive warehousing operation. On an ongoing basis, bulk food deliveries come in and are distributed to the campus dining halls. Usually, that’s not a problem, but at times, things go wrong. In the fall of 2016, the university received 500 2.5-gallon tubs of mayonnaise. Student diners immediately noticed that something was rotten or, more accurately, spoiled. They reported the problem to the food services team which quickly realized the problem — the mayo had frozen in transit and then thawed. That ruined the entire 1,250-gallon load (which weighed about 10,000 pounds). The school typically donates excess food to a local food bank, but the gone-bad-mayo wasn’t even suitable for that. So, what did Michigan State do? They turned the mayonnaise into electricity. Luckily for the school, in 2013, the university had opened up an anaerobic digester — a huge contraption which the school described as “a sealed tank, deprived of oxygen, in which organic waste is degraded at an elevated temperature [allowing certain types of] waste material to decompose quickly and produce methane that can be captured and used as fuel.” The University had a lot of suitable waste anyway — the digester was designed to handle cow manure from the school’s farms, and food waste from the dining halls — yet no one expected it to become the final home of five tons of mayonnaise. But when life gives you spoiled mayo, you do the best can you to turn it into the proverbial equivalent of lemonade. Mayonnaise is essentially made of egg yolks and cooking oil, which means that it has a very high fat content — a great meal for the bacteria in an anaerobic digester to feast on. (This, per Treehugger, makes mayo the “perfect fuel” for such a device.) So in the mayo went. In fact, the solution was so obvious, the University didn’t think the spoiled condiment was a big deal at all. Instead, it became an odd activity for twelve employees, who spent an eight-hour day in December dumping jug after jug of the white goop into the digester, as seen above. Hopefully, the mayo in the digester created enough excess power to account for their dry cleaning needs. Bonus fact: If you’re a fan of mayo, you probably have had a jar of Hellmann’s or Best Foods brand mayonnaise in your house recently — but it’s very, very unlikely that you have both of them. Both are leading mayo brands and they’re very much alike: similar logos (seen here), the same tagline (“bring out the best”), and even the exact same ingredients. That’s because they’re the exact same product and made by the same company, Bestfoods (now owned by Unilever). In 1927, Bestfoods — which was the dominant brand west of the Rocky Mountains — bought Hellmann’s, which was dominating in the eastern United States. In order to maintain that dual dominance, the company kept the brands separate, divided only by region, even as the products became increasingly similar. That decision is one Unilever maintains today — Hellmann’s in the east, Best Foods in the west. Outside the U.S., there’s similar factionalization — in Asia, Australia, and New Zealand, the mayo is sold as Best Foods; elsewhere, it’s Hellmann’s. From the Archives: Yogurt Power: Another digester success story.